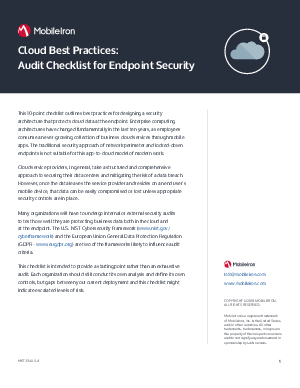 This 10-point checklist outlines best practices for designing a security architecture that protects cloud data at the endpoint. Enterprise computing architectures have changed fundamentally in the last ten years, as employees consume an ever-growing collection of business cloud services through mobile apps. The traditional security approach of network perimeter and locked-down endpoints is not suitable for this app-to-cloud model of modern work.